The material from which this sketch is taken has been compiled from many years of research and correspondence. These efforts have been made by Mrs. Bertha Y. Jensen . She has very graciously shared this material and has given generous assistance and encouragement at all times. To all others of our family and to our genealogical correspondents, we extend our gratitude. We will not list their names at this time due to lack of time and space and hope that they will understand. There is no record of a Tyson Co., N.C. There was, however, a Tryon Co. formed in 1768 and discontinued in 1779. Rutherford Co. was formed in 1779 from part of the former Tryon Co. In the year 1816 a postoffice was noted at William Tyson's store in Rutherford Co. Early that summer Austin entered the service of the state of N.C. as a volunteer from Rutherford Co. He went to McKinney's Station on the Broad River and attached himself to the command of Col. William Graham, leader of the Rutherford Co. Militia. He was directed to detach 25 men and proceed to Chimney Mt on the Broad River. For four and one half months they guarded the mountain passes between Chimney Mt. and Green River Cove (Cave?) a distance of about 20 miles. This was done in order to prevent the Cherokee Indians (then hostile) from making incursions between these points, upon the defenseless frontier settlers. In September of this same year these troops were disbanded. In 1781 Austin visited relatives in South Carolina, and while there, troops were called to aid in the siege of old Ninety Six (an old district in S. C.) He volunteered and attached himself to Obid Holloway's company. They were so engaged for a period of forty days, from the 22nd of May to the 19th of June 1781. The first Federal Census taken in 1790 indicates Austin as a resident of Ninety Six District in S.C. The family then consisted of 1 male over 16, 1 male under 16, and 4 females. Thus 2 males and 1 female were no longer in the family household. We find Sophie Yancey married to Burrell Bell, 17 Jan 1797. The witness to this marriage was Austin Yancey . Perhaps Sophie was one of the two unnamed daughters, and either her father or her brother was her witness. This was in Blount County, Tenn and it was about this time that our family started on it's long and slow westward migration. Nancy, the youngest daughter, in 1805 married Benjamin Franklin Kelley . He was the son of Richard Kelley and Maria (Gibbs) Kelley who immigrated to America in 1773. After living in Williamson County for about 25 years Hiram and Elizabeth Pratt Yancey, their eight children and their respective families, in 1853 left Illinois and started west. During their journey, as the passed though Missouri, Elizabeth died and was buried along the trail. Lillian Yancey Bogardus' line of descent is as follows: Lillian, William Henry, Alonzo Tennen, William Riley, Hiram John Sr, Austin Yancey. Bertha Yancey Jensen's line of descent is as follows: Bertha, Adam, Hiram John Jr., Hiram John Sr, Austin Yancey. - Although the parentage of Austin Yancey Sr has yet to be proven, it seems quite logical and probable that he was the son of one William Yancey and Sophia Davis of North Carolina. Sophia Davis was the daughter of one Richard Davis and is mentioned in his will of 1760 in Granville Co., NC. In 1768 Austin Yancey signed as a witness on a deed record of William Yancey in Rutherford Co., NC. William Yancey appears to have traveled much, possibly to South Carolina and later Tennessee where he died in Montgomery County about 1810. "Inventory of the estate of William Yancey, decd. One note for the sum of twenty pounds bearing date on the day of August one thousand seven hundred & ninety two. Subscribed by Samuel Earl. P. Darby Adm.
"State of Tennessee, Montgomery County. Agreeable to an order of Court to us James Hambleton & David Gould Justices of the peace for Montgomery County, directed January Term 1816 for the purpose of settling with patrick Darby, administrator of the estate of William Yancey, late, of Montgomery County, deceased, reports as follows: No 1 that a note on Samuel Earles for 23 pounds, six shillings, eight pence as appears of record, said Earles proved on tryal to have been paid for costs on the said suit of Earles $9.85. Letters of Administrators.80 $10.65. Rendered January Term 1816"
The parentage of this William Yancey is another mystery. If we follow the theory that all Yanceys descend from either Lewis Davis Yancey of Culpeper or Charles Yancey of Hanover - then it would seem most likely that William was either a son or more probably a grandson of Charles Yancey of Hanover - possibly by either John or Charles Yancey for whom little information is available. A probable sibling of Austin Yancey Sr includes one Fanny Yancey who married Nathan Dobbs about 1790 in Georgia and had a son named Austin. Another possible sibling is one Charles Yancey who died in early Georgia leaving various children - including possibly an Alfred Yancey who married an Elizabeth Dobbs (relative of Nathan Dobbs). The name of Austin Yancey Sr's wife as well as the marriage date and the names of many of the children along with birth dates - is not well proven. The source of this information appears to be information gathered by a descendant - one E. L. Kelley in research and travels through the South. These records were later referenced in various "Re-organized Church of Jesus Christ of Latter Day Saints" archival records (headquarters in Independence, Missouri) as well as information included on early DAR applications of descendants of Austin Yancey. 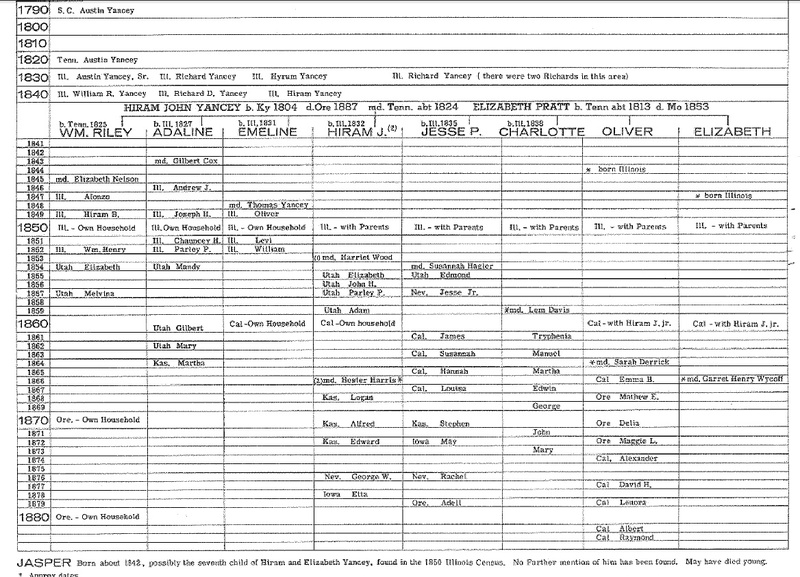 Proof for this family information is lacking - but there is nothing to indicate that the information may be incorrect. Another possible daughter not recorded here is one Elizabeth Yancey who married Isham Farris 9 Jan 1806 in Knox Co., KY. Yet another Yancey who appears to have some connection to the Austin Yancey family is one Betsy Yancey who married Christopher Rynierson Sr as well as a Mary Yancey who married his son Christopher Reynierson Jr - 13 Jul 1827 in Casey Co., KY.
 Austin Yancey's Revolutionary War Pension application can be found in the National Archives under the following number R11921. Austin's application is dated the 8th of October 1833 and give his age as 81 years, 1 month, and 10 days. A letter in the National Archives file rejecting his claim is dated 3 April 1836. It should be noted that various records report one Arthur (or Austin) Yancey being a Rev. War Soldier who died in Fulton County, Illinois. The source of this information appears to be a single page in the National Archives File of (our) Austin Yancey of Franklin County Kentucky - which seemingly, in error, records the name as Arthur, instead of Austin, and records the burial place as Fulton County, Illinois - although no other page in the entire file mentions Fulton County. Interestingly, this page is most often NOT included with material sent to those requesting copies of this material from the National Archives. All evidence seems to indicate that both the name of Arthur as well as the burial place as Fulton County, Illinois are in error. There is no evidence that Austin Yancey ever left Franklin County, Illinois. There is also a deed record of William Yancey in Tryon Co., NC in 1769 of which Austin Yancey was the witness. It is thought this was his father. Also there does not actually seem to be any real evidence of TWO Austin Yanceys - father and son. This is from LDS (Mormon) Church records, originally of Ft Weber, Utah (now housed at Church headquarters in Salt Lake City, Utah). Hiram John Yancey's birth place, as originally transcribed from these records as "Carey City, Kentucky" and which has been recorded on Family records since the 1930's - is now in question. A review of these records would indicate that Carey City, Kentucky was in error and is actuality correctly recorded as Casey County, Kentucky. Bell County (formed in 1867) was not recorded as birth place of Hiram on these original records - but was reported in Family Records after atlases had been referenced in ascertaining a location for a "Cary/Carey City, Kentucky". There are some evidences of this family being in Casey County, Kentucky. Casey County was formed in 1807 from Lincoln County, where Austin Yancey (Jr.?) is recorded on tax records from about 1800-1806. It should be noted however, that Bell County was formed in 1867 from Knox & Harlan Counties which were also originally part of Lincoln County Kentucky. There seems to be little, or no, information about this Elizabeth Pratt. Some early reports recorded the father of Elizabeth as one Asahel Pratt - this was later found to be in error. Given the fact that one of her sons is named Jesse Pratt Yancey - one wonders if her father was named Jesse. Family stories tell of her dying on the trail as the family travelled from Illinois to St Joseph, Missouri from where they joined wagon trains going west. Matilda married a widower by the name of William Stevens - they later traveled to Utah. She is buried in Holden, Utah. A grave marker records her birth & death dates as well as her parents names. She had no children of her own. Further research needs to be done to ascertain whether Matilda Married William Stevens before or after the arrival in the Utah Valley (there are conflicting records). Records seem to indicate that at least some of the Yanceys, including Hiram John Yancey Sr, were part of the Campbellite movement in America in the 1830's. Various members of the Campbellite movement later became converts to the Latter Day Saint movement founded by Joseph Smith. It was the year 1844, that various members of the Yancey family were converted to the Church of Jesus Christ of Latter Day Saints, also known as the "Mormons". It would seem that most of Austin Yancey Sr & Jr's children who had moved to Illinois were converted to this new faith. It is interesting to note the name of "Parley Pratt" among some of this family - raising the theory that the Mormon leader Parley P. Pratt was a key figure in their conversion - but nothing has been found to support this theory. It was about this same time, 1844, when the prophet Joseph Smith, leader of the church was assassinated, the church broke up into two main groups - those that stayed in Illinois and Missouri and later became known as the "Reorganized Church of Jesus Christ of Later Day Saints (RLDS)". The other group under the direction of Brigham Young traveled west to Utah starting about 1847 and settled in the Salt Lake Valley, later establishing Mormon colonies throughout the Rocky Mountains - members of this latter group are often referred to as "LDS". Many of The Yancey family - like Nancy Yancey Kelley and her descendants as well as William R. Yancey and Richard Kelly Yancey and their families stayed in Illinois and many of them were leaders in the RLDS church. Among the descendants of Nancy Yancey Kelley is Bishop E. L. Kelley who was presiding Bishop of the RLDS faith as well as his brother W. H. Kelley who was among the Quorum of the Twelve Apostles (RLDS). Some of Nancy's descendants were also part of the "Christian Church" - Christopher Greenup Kelley was a minister for the Christian Church. Austin Yancey's children Hiram John, and Matilda Yancey travelled west and probably arrived n Utah the late fall of 1851 (though soem report 1853). This was a little after the major exodus to Utah from 1847-1850 - which raises the question why they hadn't come earlier. Hiram's descendants appear to have settled around Ft Weber near what is now Bountiful, Utah. Most of them, however, appear to have become dissatisfied with the LDS (Mormon) Church and most of them traveled on west to California about 1859 at the time of Johnston's Army - leaving the Mormon church, some later went North to Oregon. Hiram John Yancey Jr., left his pregnant wife in Bountiful, Utah and her later-to-be-born son, Adam Yancey is the ancestor of most of the Mormon Yanceys of Utah and Idaho. There were even newspaper reports concerning Hiram's leaving his wife in the Utah Valley. Matilda Yancey also stayed in Utah and died there - she did not have any children of her own but was the stepmother to her husbands children from a previous marriage. 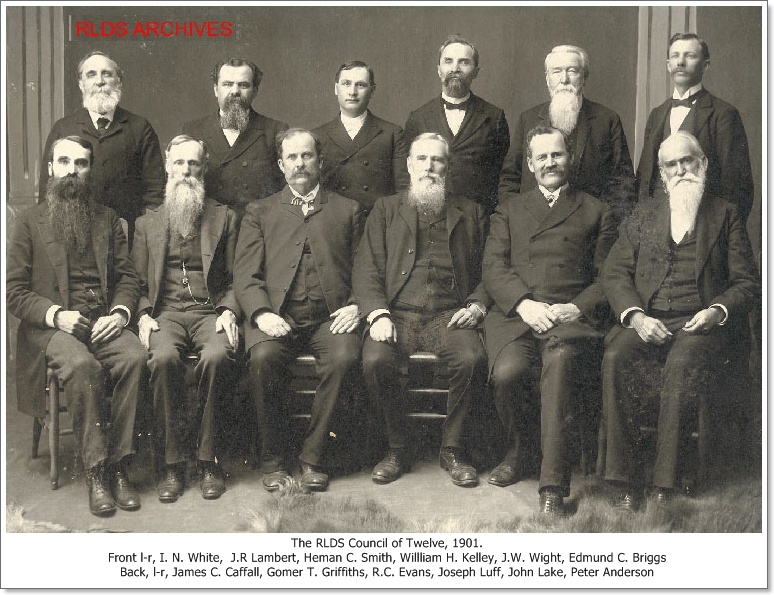 Some of Richard Kelley Yancey's descendants (who had stayed in Illinois) later migrated from Illinois to Utah and were members of the LDS faith. Also of interest is that various of Christopher Greenup Kelley's descendants ended up moving west to Utah and Idaho (though they were not LDS). There are three known signatures of an Austin Yancey. The first is found in 1797 in Blount County, Tennessee as a witness to the marriage bond of Sophia Yancey and Burrell Bell. The name is spelled "Austin Yancey". 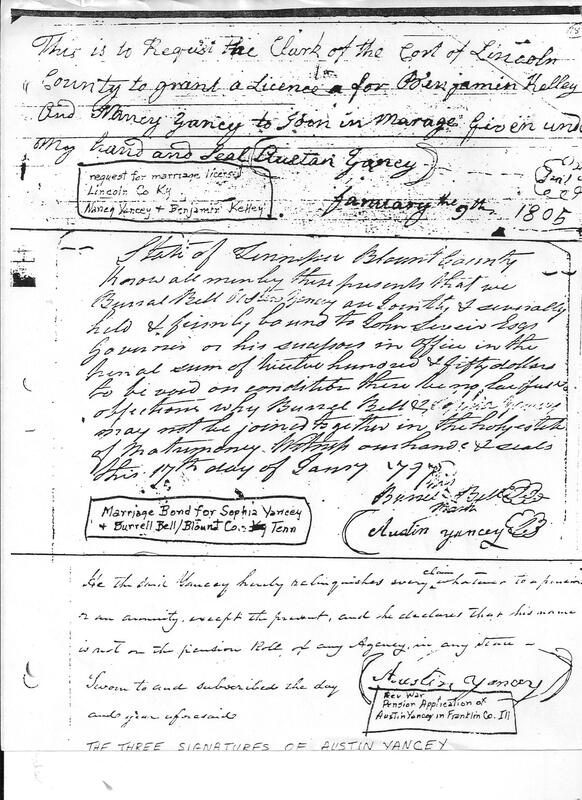 The second signature is recorded in 1805 in Lincoln County, Kentucky Court Records where an Austin Yancey requested a grant for a marriage license for Nancy Yancey who was marrying Benjamin Kelley. The name is written as "Austan Yancy" and does not match the signature on Blount County, Tennessee records. The third signature is on the Revolutionary War Pension Application of Austin Yancey Sr who was living in Franklin County, Illinois in 1833. This signature appears to match the Blount County, Tennessee signature. Some claim that the difference of the Lincoln County, Kentucky signature from the other two is evidence of there being two different Austin Yanceys (Sr & Jr) and that the one in Lincoln County, Kentucky was Austin Yancey Jr. - but one should seriously consider that the signature that looks different than the other two - is becauwe it was written by the clerk - and is really a copy of the origonal doucment - copied by the clerk. Lincoln County was one of three original Kentucky Counties - established when Kentucky became a state. Knox County was formed in 1800 from parts of Lincoln County. Casey County was formed in 1807 from parts of Lincoln. Harlan County was formed in 1819 from parts of Knox County. Bell County was not formed until 1867 from parts of Harlan and Knox Counties. Military records for Hiram John Yancey and William Riley Yancey are on file in the National Archives. Information is found in these files that is not found elsewhere - such as in formation about the second marriage of Hiram John Yancey. 1790-1850 census records below. One interesting thing to consider is that, although most Yancey families of the pre-civil war South were slave owners - and slave ownership was something recorded on the Federal Census Schedules. Census records for Austin Yancey and his descendants indicate that they did not own any slaves. 1800 census - Censuses for Kentucky and Tennessee of this year were destroyed. 1810 census - Neither Austin nor any of his children are found on the 1810 census of Kentucky. The 1810 census of Tennessee was destroyed. Based on the above and other information the families of Austin Yancey Sr and Jr. are here summarized. It must be kept in mind, however, that it seems quite possible that all of the children listed may have been children of Austin Yancey Sr. and that they were from a second marriage to Maria. Nothing has been found to prove it one way or the other - but there really are no records that prove that there were two different Austin Yanceys at one time - this tends to make one believe that there was only one Austin Yancey with two successive wives. James Yancey, bn abt 1789/90 - Moved to Gwinnett Co., GA ?? Info on Hiram John Yancey Jr. It looks as if Hiram John Yancey may have had a marriage everyone seems to have missed.